Principal photography is underway on New Line Cinema’s comedy “Horrible Bosses”. For Nick, Kurt and Dale, the only thing that would make the daily grind more tolerable would be to grind their intolerable bosses into dust. Unfortunately, quitting is not an option. So with the benefit of a few-too-many drinks and some dubious advice from an ex-con, the three friends devise a convoluted and seemingly foolproof plan to rid themselves of their respective employers permanently. There’s only one problem - even the best laid plans are only as foolproof as the brains behind them. Read on to find out the cast and crew behind "Horrible Bosses". 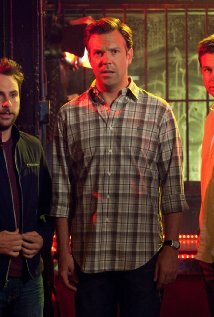 Seth Gordon (“Four Christmases,” “The King of Kong: A Fistful of Quarters”) directs “Horrible Bosses” from an original screenplay by Michael Markowitz, with revisions by Jonathan Goldstein & John Francis Daley. Brett Ratner and Jay Stern are producing the film, with Richard Brener, Michael Disco, Sam Brown and Diana Pokorny serving as executive producers. John Cheng, John Rickard and Mary Rohlich are co-producers. The film stars one hell of a cast with Jason Bateman, Charlie Day, Jason Sudeikis, Jennifer Aniston, Colin Farrell, Jamie Foxx, Kevin Spacey, Julie Bowen and Donald Sutherland. Bateman, Sudeikis and Day play the three hapless workers while Spacey, Farrell and Aniston are their unbearable bosses. Foxx appears as the con whose street cred is priced on a sliding scale. "Horrible Bosses" is slated for release starting July 29, 2011. It will be distributed by Warner Bros. Pictures, a Warner Bros. Entertainment Company.